Ayoze Perez scored his seventh Premier League goal of the season as Newcastle beat LeicesterRafa Benitez has urged Newcastle to be "more competitive" in the summer transfer market after they took a big step to retaining their Premier League status with victory at Leicester. Ayoze Perez scored his first away league goal of the season with a glancing header as the Magpies recovered from back-to-back defeats to move 10 points clear of the relegation zone. Newcastle spent just over £20m last summer - plus a further £20m in January - and manager Benitez, whose contract is set to expire at the end of the season, says they can "compete" with teams in the top half of the league by doing the "right things". "You can do everything right with your tactics, but the other team has one player that can make the difference," Benitez, whose side have moved up to 13th place, told Sky Sports. "You'd have to pay £30m to buy a Leicester player. "The Foxes started confidently, having won their previous four matches under Brendan Rodgers, but they struggled to play through their disciplined visitors.Salomon Rondon almost handed the visitors a spectacular lead when he struck the crossbar with a powerful free-kick from 35 yards. Newcastle remained resolute and were rewarded when Perez struck the decisive blow with over half-an-hour played. The Spaniard rose well inside the Foxes' box to meet Matt Ritchie's cross and nod the ball over Kasper Schmeichel. Rodgers' first home defeat as Leicester boss sees his side remain in seventh, although eighth-placed Wolves are level on points with two games in hand. Leicester dominated the ball with more than 70% possession but Newcastle sat deep and restricted them to just five shots on target in the entire match.Martin Dubravka saved well after a solo run by Harvey Barnes and a right-footed strike by Ben Chilwell as Leicester tried to force the initiative early on, but it was the visitors who posed the greater threat on the counter attack - and Rondon's 15th-minute free-kick almost brought spectacular reward.Benitez' side were rigid in their shape and targeted Leicester midfielder Wilfred Ndidi, who lost the ball nine times in the first half, before springing clear in attack. Ritchie whipped in two testing crosses with his excellent left foot before Newcastle took the lead, as Leicester failed to heed the warning. 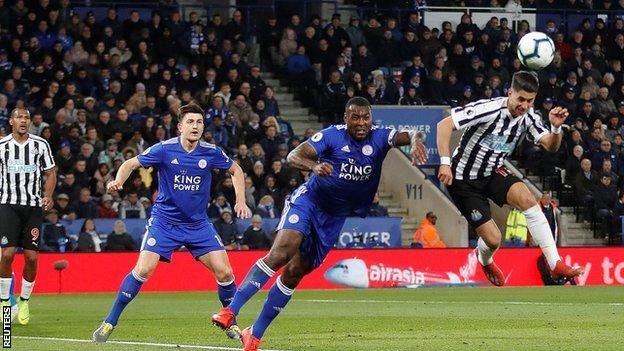 The visitors pinched the ball deep in the Leicester half once more before Ritchie delivered an accurate cross for Perez to convert for his seventh Premier League goal of the season - securing just Newcastle's third win on the road. Rodgers' tenure as manager got off to a losing start with defeat at Watford, but the Northern Irishman seems to have lifted the mood at the club in recent weeks having secured four wins from five games in charge.Jamie Vardy has enjoyed a resurgence in his form with eight goals in eight games before Friday, but he was denied the opportunity to run in behind Newcastle.The Magpies sat deep, allowing Leicester possession in the midfield but making it tough for them to play between the lines. When Vardy's chance eventually came in the final 10 minutes - as Youri Tielemans slid him through on goal - he appeared to rush his effort and lifted the ball over the crossbar.James Maddison - who has created more chances than any other Premier League player this season - is key to Leicester's creativity and if he has a poor game, the team tends to suffer.The 21-year-old found it difficult to pick up the ball in space and he made just one key pass forward in the whole 90 minutes.Leicester are in still in the hunt for European football this season but Rodgers will have to find an alternative way of utilising his forwards when opposing teams sit deep. Leicester manager Brendan Rodgers said: "It's difficult to break down a team like that. It's an area we will get better at. There wasn't a lot in the game, our final pass just wasn't there but we gave everything. We couldn't break down their defence. "We will learn from it; this is why I am here. In games like that, you have to stay patient and have tactical discipline. The players have been first class since I came here but if you're not quite on it, a result like this can happen. "The speed of our passing in particular can be much better. We let them get into shape too early. It needs to come quicker. We changed it around a few times but it was one of those evenings. It will be good for our learning going forward. "Newcastle manager Rafa Benitez said: "It was a good game against a good team. We did very well. Our players worked so hard. This relationship between the players and fans means a lot to us. The players and fans tried to do their best. "As a coach, you always have a game plan. You can prepare however you want but it depends on the players to make the difference. "The problem against James Maddison or Jamie Vardy is you have to concentrate from the first minute to the last. We are really pleased with the clean sheet and three points. You have to enjoy today and be ready for the next one. "We had two or three counter-attacks that we could have had a little more composure and scored more." Posted at 90'+6' Second Half ends, Leicester City 0, Newcastle United 1.Posted at 90'+4' Offside, Leicester City. Kasper Schmeichel tries a through ball, but Kelechi Iheanacho is caught offside.Posted at 90'+4' James Maddison (Leicester City) wins a free kick in the defensive half.Posted at 90'+4' Foul by Mohamed Diame (Newcastle United).Posted at 90'+3' Attempt saved. Harry Maguire (Leicester City) header from the centre of the box is saved in the bottom left corner. Assisted by Marc Albrighton with a cross.Posted at 89' Youri Tielemans (Leicester City) wins a free kick in the defensive half.Posted at 89' Foul by Isaac Hayden (Newcastle United).Posted at 88' Foul by Nampalys Mendy (Leicester City).Posted at 88' Christian Atsu (Newcastle United) wins a free kick in the defensive half.Posted at 88' Attempt missed. Kelechi Iheanacho (Leicester City) header from the centre of the box misses to the left. Assisted by Marc Albrighton with a cross following a corner.Posted at 88' Corner, Leicester City. Conceded by Jamaal Lascelles.Posted at 85' Attempt saved. Kelechi Iheanacho (Leicester City) header from the centre of the box is saved in the bottom right corner. Assisted by Marc Albrighton with a cross. Posted at 82' Substitution, Newcastle United. Mohamed Diame replaces Ki Sung-yueng. Posted at 80' Substitution, Leicester City. Marc Albrighton replaces Harvey Barnes.Posted at 79' Attempt missed. Jamie Vardy (Leicester City) left footed shot from the centre of the box is too high. Assisted by Youri Tielemans with a through ball. Posted at 78' Substitution, Newcastle United. Christian Atsu replaces Miguel Almiron. Posted at 77' Javier Manquillo (Newcastle United) is shown the yellow card for a bad foul.Posted at 77' Ricardo Pereira (Leicester City) wins a free kick on the right wing.Posted at 77' Foul by Matt Ritchie (Newcastle United).Posted at 76' Attempt saved. Ayoze Perez (Newcastle United) right footed shot from the right side of the six yard box is saved in the bottom right corner.Posted at 75' Attempt missed. James Maddison (Leicester City) right footed shot from outside the box is high and wide to the right from a direct free kick. Posted at 74' Fabian Schar (Newcastle United) is shown the yellow card for a bad foul.Posted at 73' Harry Maguire (Leicester City) wins a free kick in the attacking half.Posted at 73' Foul by Fabian Schar (Newcastle United).Posted at 73' Corner, Leicester City. Conceded by Fabian Schar. Posted at 72' Substitution, Leicester City. Nampalys Mendy replaces Wilfred Ndidi. Posted at 72' Substitution, Leicester City. Kelechi Iheanacho replaces Demarai Gray.Posted at 69' Delay over. They are ready to continue. Posted at 68' Kasper Schmeichel (Leicester City) is shown the yellow card.Posted at 68' Delay in match Matt Ritchie (Newcastle United) because of an injury.Posted at 68' Offside, Newcastle United. Ayoze Perez tries a through ball, but Salomon Rondon is caught offside.Posted at 66' Attempt missed. Harvey Barnes (Leicester City) with an attempt from the centre of the box misses to the right. Assisted by Ben Chilwell with a cross. Posted at 63' Ki Sung-yueng (Newcastle United) is shown the yellow card for a bad foul.Posted at 63' James Maddison (Leicester City) wins a free kick in the attacking half.Posted at 63' Foul by Ki Sung-yueng (Newcastle United).Posted at 62' Attempt blocked. Youri Tielemans (Leicester City) right footed shot from outside the box is blocked. Assisted by Harvey Barnes.Posted at 61' Ben Chilwell (Leicester City) wins a free kick in the defensive half.Posted at 61' Foul by Miguel Almiron (Newcastle United).Posted at 60' Harvey Barnes (Leicester City) wins a free kick on the left wing.